The general opinion of many is that you can't have enough gears on your bicycle. The current development has arrived at tenfold and elevenfold cassettes. Togehter with a threefold crank that makes it up to 33 gears (arithmetically speaking). On the opposite stands a in the recent years increasing movement of bike purists who discovered that sometimes less is more. This movement has its origin in San Francisco and New York both strongholds of bicycle couriers. They discovered that with the introduction of modern gearshifts on their bicycles the Diese stellten fest, dass mit der Einführung moderner Gangschaltungen an Ihren Rädern, the wear and the maintenance costs increased. Furthermore such bikes were quite expensive in the acquirement. So what was to do? Some couriers used bicycles that had no gearshift but a fixed gear without a free wheel. The „comfortable“ side effect for the couriers: With a fixed gear you coul also brake so they were able to save the brakes and the felloe and brake block wear. Togehter with the typical courier bags the fixies became the symbol of the bicycle couriers. Similarly hated, dreaded and admired from other traffic the couriers soon curled through the traffic of many big towns in the Western civilization. Prodded by this image of almost boundless bicycle freedom more and more people acquired a taste for such puristic bikes and meanwhile many manufacturers offer complete bikes and special equipment in this area. We like this bikes because of their headstrong and very clean look and the „experience“ to be on the road with such a simple peace of technique is just nonrecurring. Nevertheless here is a word of caution: In Germany two independently operating brakes on the wheel are provision – also on a fixie! In our opinion this is good because braking through blocking of the rear wheel by pure leg strength is relatively easy to learn and with the right technique and practise also quite easy to control but the breaking distance is considerably longer as with a conventional brake system. Therefor in emergency situations it should always be available. Singlespeeder – umbrella term for one-gear-bikes mostly with free wheel bevel. 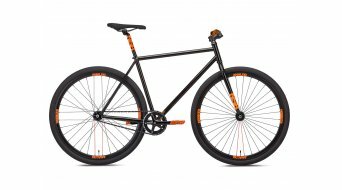 Fixie or track bike – one-gear-bike with fixed gear without free wheel. Whoever is sick of constantly pedaling on a Fixie can set up a free wheel bevel and still enjoy a singelspeed-bikes. Many singlespeed hubs have a winding on both sides so that you can set up fixed bevel on the one side and a free wheel bevel on the other side. Like that you stay flexible even if you are on your way by extending and turning the rear wheel. But we can recommend it to everybody to try a fixie because it challenges even experienced road cyclists. Whoever likes the idea of gearing down but doesn't want to buy a completely new bike we recommend a a slightly cheaper option. Grab an old road bike and build up a singlespeeder. You usually only need a singelspeed rear hub, a bevel (fixed or with free wheel) and maybe achain ring. Like this you get a real courier bike with little money. All components and of course all complete bikes and frames you can find here.